The Brooklyn-based artist engineers each venue’s unique installation using computer-assisted design software and then meticulously hand crafts the segments’ intricate design. Appearing almost weightless, the interconnected ribs and tissue-like skin that make up “A Brief History of Aviation” rise, separate, and converge rhythmically within the confines of the gallery architecture. Dennis Harper, curator of collections and exhibitions at the museum, said the opportunity to showcase this work came at an opportune time during the long-range exhibition planning. Henderson will present a talk at the museum Thursday, Sept. 26, at 5 p.m. in the Martin-Perricone Auditorium. Seating is limited, so advanced registration is encouraged via the Eventbrite application of the museum’s web site www.jcsm.auburn.edu/programs. 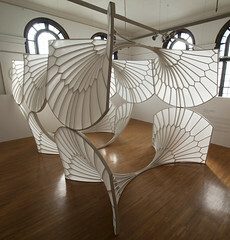 Henderson said he drew inspiration for “A Brief History of Aviation” from a 15th-century cathedral ceiling, but the installation itself was manifested through 21st-century technology in the form of computer-aided design programs, or CAD. The ability to adjust comes in handy, as the museum’s Grand Gallery is the sixth venue to host the traveling exhibition. Prior to delivering some materials in August, Henderson had only seen floor plans, measurements and photos of Auburn’s museum. Henderson lives and works in Brooklyn, New York. Born in Atlanta, Ga., he received his bachelor’s degree at Bard College, and his master of fine art degree at Columbia University. His art has been written about in ArtNews, the Boston Globe, the New York Times and The New Yorker among other publications and has appeared in exhibitions across the United States and in Paris. Visitors can see Henderson’s work on view Tuesdays-Saturdays from 10 a.m. to 4:30 p.m., with extended hours until 8 p.m. on Thursdays and Sundays 1-4 p.m. Admission is free courtesy of the JCSM Business Partners. The museum is closed to the public on Mondays but academic tours may be scheduled by appointment by contacting jcsmtours@auburn.edu. For additional information, call (334) 844-1484. For more information about David Henderson, go to www.davidhenderson.org.